Click the name of each download to be taken to their respective download page. Using special PC software I have finally been able to extract the complete soundtrack and host it online! 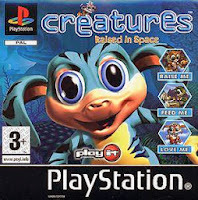 One thing worth noting however is the fact that both PS1 games, Creatures PS1, and Creatures: Raised in Space, share the exact same soundtrack. However, I have decided to label the collection of tracks as "Creatures: Raised in Space" seeing as the music in Raised in Space was actually unique to each area of the game rather than simply playing at random as was the case with its predecessor. Hopefully this should also help people locate their favourite tracks. All files originally hosted at The Crazy Shee's Lab and used with permission. Adds coloured eyes and mouths to the Bengals de Neiges available from Creaturesfrance.